Brown maple furniture is very popular—in fact brown maple is one of the most popular wood types on DutchCrafters. But many people ask, what is brown maple? 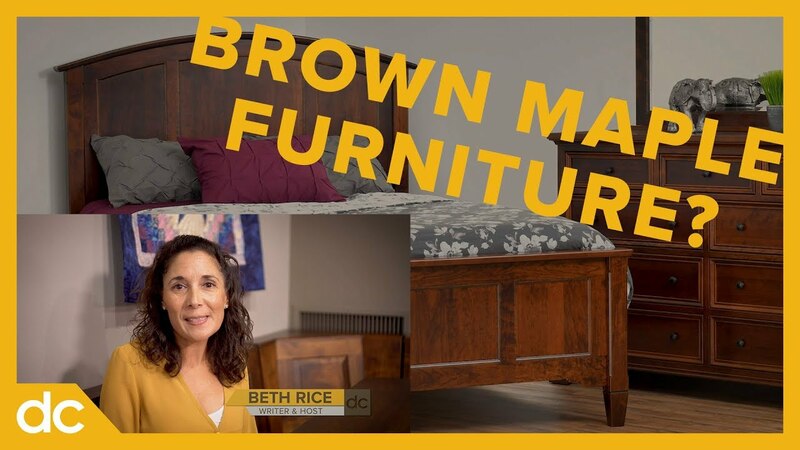 This video answers that question, with brown maple pros and cons and all you need to know about brown maple wood furniture. Maple furniture makes a great choice for furniture of all rooms and styles. Brown maple dining room furniture, such as a brown maple table or island or brown maple chair, highlights the unique and distinctive maple wood grain. A brown maple bed and other brown maple bedroom furniture showcases the strength and durability of the wood. It is one of the softer of the hardwoods but yet holds up well to heavy use. Where could you use a brown maple piece in your home? You may also be interested in hard maple wood, at the maple furniture page. Is brown maple the right hardwood for me? Let’s look at some of the distinctives of brown maple wood. Brown maple is not a type of tree. Rather, it’s the lumber taken from the heartwood: the center of maple trees. Hard maple, by contrast, is sapwood taken from the outer section of the log. Brown maple wood, like cherry, is one of the softer hardwoods. It’s very durable and great for many uses but may sustain dents and nicks slightly more easily than walnut or oak furniture. Your exploration of brown maple wood really begins with the grain pattern. Brown maple is best known for variation, with quirky grain pattern and an irregular finish. In a natural or light finish, you’ll notice gray-green mineral streaking through the wood. For this reason, we often recommend a darker finish on brown maple. Additionally, it will take stain unpredictably, leaving some sections significantly darker than others. With much smoother grain than oak, brown maple is the best hardwood to paint. If you’re looking for brightly colored hardwood furniture, a white finish, or a distressed painted look, brown maple is your best choice. Depending on your hardware and finish, brown maple can fit any style, from contemporary to traditional to country. Brown maple is a popular wood type throughout the house, from dining to bedroom to living room. Brown maple and oak are almost always the least expensive hardwood options, so you can get all the options and features of a quality hardwood piece at a better price point than cherry or quarter sawn white oak. Brown maple is popular for its stylistic flexibility, unique wood grain, and price point. But it really comes down to your opinion of the grain and color variation. So, is brown maple right for you? We’ve given you the information. What will you decide?